Aggravated assault is an extremely common charge in NJ. A bar fight that might otherwise have resulted in misdemeanor simple assault charges can instead lead to felony aggravated assault charges, depending on the extent of the injuries suffered by the other person. Because aggravated assault is an indictable felony-level offense in NJ, a person charged with aggravated assault could be looking at serious prison time, in addition to other penalties outlined below. If you or a loved one has been charged with aggravated assault in Morris County NJ, it is important to speak with an experienced Morris County NJ aggravated assault attorney who understands the system. The criminal trial team at our Morristown offices has extensive experience defending clients charged with assault and threat crimes in Morris County NJ courtrooms, including courts in Morristown, Denville, Mount Olive, Budd Lake, East Hanover, Victory Gardens, and Parsippany-Troy Hills. We also have an active Morris County municipal prosecutor on staff, which gives us unique insight into how to help you beat your charges. Call us today at (908) 336-5008 for a free consultation. And here is an example where we successfully handled a Second Degree Aggravated Assault Charge in Morris County NJ. (10) Knowingly points, displays or uses an imitation firearm, as defined in subsection f. of N.J.S.2C:39-1, at or in the direction of a law enforcement officer with the purpose to intimidate, threaten or attempt to put the officer in fear of bodily injury or for any unlawful purpose. The degree of injury inflicted or attempted to be inflicted on the victim. Whether a firearm or other deadly weapon was used. The mental state of the defendant when committing the act. The occupational status of the victim. A Felony Charge on Your Permanent Criminal Record. Second degree aggravated assault has a maximum penalty of 10 years in NJ State Prison. The charge has a presumption of incarceration, which means that a person convicted of second degree aggravated assault will probably face a minimum term of incarceration of five (5) years in NJ State Prison. Additionally, because aggravated assault is covered under the No Early Release Act (NERA), 85 percent of the sentence must be served. Second degree aggravated assault also exposes a defendant to a fine of up to $150,000.00. A prosecutor may file second degree aggravated assault charges if the defendant attempted to cause “serious” bodily injury. As used here, “serious” means that the injury exposed the victim to a risk of death. A person may also be charged with second degree aggravated assault if he or she caused bodily injury while attempting to elude a law enforcement officer. Third degree aggravated assault can be the charge when a defendant purposely or knowingly caused bodily injury to another person while using a deadly weapon. Third degree aggravated assault penalties include prison time ranging from three (3) to five (5) years and a fine of up to $15,000.00. A prosecutor may bring third degree aggravated assault charges if the defendant caused “significant” bodily injury. As used here, “significant” means that the injury created a temporary loss of the function of a body part or the temporary loss of one of the five senses. Third degree aggravated assault may also be charged if the defendant knowingly caused bodily injury while using a deadly weapon. A charge can also be elevated to third degree aggravated assault if the victim was a police officer, firefighter, health care or utility worker, teacher, or judge. Fourth degree aggravated assault is a felony that exposes a defendant to up to 18 months in state prison, a fine of as much as $10,000.00, and a permanent criminal record. A prosecutor may seek a conviction for fourth degree aggravated assault if the defendant recklessly caused bodily injury with a weapon or “serious” bodily injury with a vehicle. The criminal trial team at our firm includes lawyers who have successfully represented countless clients charged with aggravated assault in Morris County and New Jersey courtrooms. Our extensive experience has allowed us to craft effective defense strategies in aggravated assault cases. 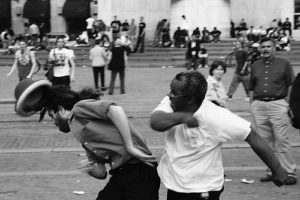 If your fight was entered into by mutual consent or if you were acting in self-defense, we may be able to get your aggravated assault charge downgraded to a misdemeanor offense or dismissed entirely. If you or a loved one has been charged with aggravated assault, contact us anytime at (908) 336-5008 or through our online form for a free consultation.